This yogi’s aura is strong—and blindingly white. All that white! White augments my aura 8 to 12 inches. It’s my protection. When your aura is healthy, it’s nine feet in all directions. Negative people and emotions and situations bounce off. Name someone with a strong aura. Bill Clinton. He walks into a room, and before he has said a word, he has caused a change in the energy. If someone has a lot of charisma, they probably have a strong aura. Where are you headed? My studio on Michigan. 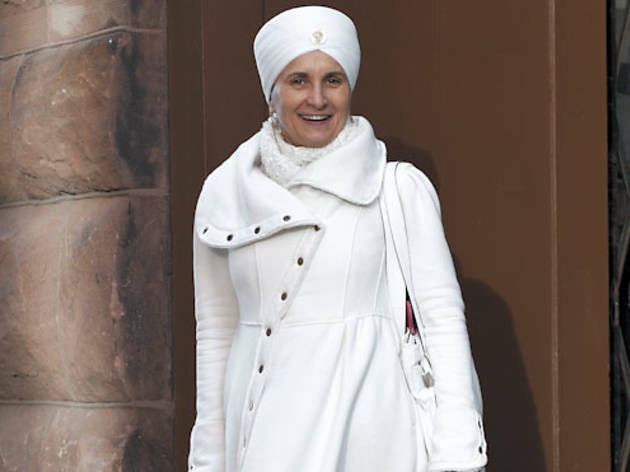 I teach a class called Kundalini Yoga in the Loop. Unlike classical hatha yoga, you don’t have to do anything perfectly. Nice turban. I wear one all the time. It’s thick—about five yards of thin fabric. Not just a hat, the turban is for my protection and uplift. It is tight, and I’m giving myself a sort of pressure-point massage. It keeps my head together. [Laughs] When I let my hair out at night, I feel a bit like an airhead.